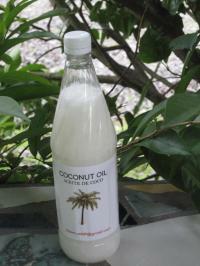 Welcome to the source for Coconut oil and Coconut oil information. SORRY I AM OUT OF BUSINESS! MY PRODUCER QUIT DUE TO MORE PRESSING MATTERS. Panama's only online coconut oil store. Local sales in Volcan at Daly's Restaurant or shipped via any of Panama's overnight carriers. Browse the site for information about Coconut oil, it's health benefits, recipes and more. Our Coconuts are grown and processed in Puerto Armuelles using low heat to dry the chopra. It is then centrifuged, and pressed to extract the oil, then filtered twice to remove the chaff from the oil. Coconut oil is non carcinogenic at frying temperatures, as is Olive oil. Coconut oil is medicinal externally and internally. My VCO is not refined, bleached or deodorized. At low altitudes in Panama the oil is liquid above 78 deg. F. If you live in the highlands, put in a hot water bath to liquidize. Most coconut oil sold in America is made from copra and is Refined, Bleached and Deodorized. Copra is the dried meat of the coconut which is left in the open to dry. Mold may grow on it, flies may land on it, and the meat turns brown and rancid while it dries. The oil industry does not worry about this, as they will "clean the oil up" at the end to remove these unfavorable constituents. Once the meat of the coconut has dried and shriveled it is easily removed from the shell and the oil is pressed out. Many companies use solvents to help in extracting the oil from the meat. Once this crude oil is produced and the solvent "reclaimed", they then add lye to the oil. This step in the refining process will drop out free fatty acids, some of the Vitamin E, as well as other nutrients and components. These items drop out as soaps to be filtered. Then they put the oil through a bleaching process which will turn it from the brown rancid color to a nice white/clear color. This process also eliminates more vitamin E and other nutrients. And then lastly they deodorize the coconut oil by bubbling gas through the oil at high temperatures while pulling the vapors off with a vacuum. This will eliminate the bad taste and smell of the crude oil it came from. In the end you have a tasteless, odorless, coconut oil with only fatty acid chains remaining "seasoned" with traces of solvents and residues from the refining process. Enjoy using a locally produced healthy product. 1. Skin Care: Wanna look like you just came back from an hour of yoga? Coconut oil works wonders as a moisturizer for all skin types, especially dry skin and aging skin, leaving you refreshed and looking wide-awake. No headstand required! The fat in the oil helps reduce the appearance of wrinkles without any irritation. Coconut oil can also help with skin problems like psoriasis, dermatitis, eczema and other skin conditions. In fact, the oil is frequently used in expensive skin care products. 2. Stress Relief: Long day at the office, kids won’t stop screaming and your dog left a little “present” on your vintage bedspread? Relieve mental fatigue by applying coconut oil to the head in a circular, massaging motion. The natural aroma of coconuts is extremely soothing thus helping to lower your stress level. 3. Digestion: The saturated fats in coconut oil have anti-bacterial properties that help control, parasites, and fungi that cause indigestion and other digestion related problems such as irritable bowel syndrome. The fat in coconut oil also aids in the absorption of vitamins, minerals and amino acids, making you healthier all around. 4. Fitness: Coconut oil has been proven to stimulate your metabolism, improve thyroid function, and escalate energy levels, all of which help decrease your unwanted fat, while increasing muscle. Because of this, coconut oil has shot to popularity by being the world’s only natural low-calorie fat. 5. Healing: When applied on scrapes and cuts, coconut oil forms a thin, chemical layer which protects the wound from outside dust, bacteria and virus. Coconut oil speeds up the healing process of bruises by repairing damaged tissues. Plus, it smells a heck-of-a-lot better than anything from the pharmacy. 6. Hair Care: $20 hair conditioners? I don’t think so! Coconut oil is one of the most nutritious products you can put on your hair. Massage a bit of the oil onto your scalp and presto – no more dandruff. Since it provides the essential proteins required for nourishing damaged hair, it’s used in a ton of over-the-counter hair products anyway. Why not cut to the chase and skip all the unnecessary chemicals? 7. Coconut oil is detoxing. 1 TBS. every 2 hours will detox. It may take a couple of weeks.